The number of public health funerals in Wales in 2017-18 was the highest for at least five years, figures have shown. There were at least 146 so-called paupers' funerals - ceremonies held by public authorities for those who died alone, in poverty or without family willing to help - up 62% on 2013-14. A funerals comparison site boss said low savings, living costs and funeral prices means many "can't afford it". One major funeral firm said it was now offering cheaper options. In May, mother-of-two Jodie Gallagher-Smith lost her husband Steve at the age of 33 after a long illness. 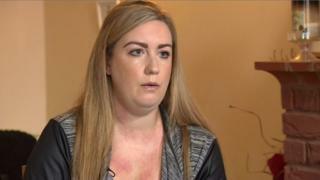 The 28-year-old from Caldicot, Monmouthshire, applied for a funeral expenses payment - a UK government grant - but said the process was "very stressful" and covered "not even half" of the bill. Mrs Gallagher-Smith's husband was cremated and she cannot afford a plot at a garden of remembrance and a headstone but is saving up. "It's really hard with, obviously, two children, you want them to have somewhere to go and remember their dad," she said. Nineteen of Wales' 22 councils responded to freedom of information requests from BBC Wales. They revealed they spent almost £200,000 on public health funerals in 2017-18 - which has doubled in the past five years - and recovered £68,300, up from £28,400 five years ago. At £37,000, Cardiff had the highest spend, followed by Swansea (£35,000) and Bridgend (£17,600). Kim Bird, who runs Cardiff-based funeral comparison website About the Funeral, said: "Because the cost of living is so great and the cost of a funeral is great, people can't afford it. "One in eight, from the latest research, can't afford a funeral and they are going into debt to the tune of £2,500 to cover the shortfall." She said people should plan ahead and discuss their funerals with family. Two reviews have been launched into funeral prices in the UK, with the Treasury particularly concerned about the cost of pre-paid funerals. Shelly Lewis, a funeral director at Co-op Funeralcare in Newbridge, Caerphilly county, said the firm offered cremations without ceremony for £1,305, and a "simple ceremony" for £1,895. "People are more aware of price now. They are looking, whereas years ago they would do what they thought they had to do, which they thought was traditional," she added. She said she a lot more people were crowdfunding for funerals - often younger people with less savings. Kate Burke from Mold, Flintshire, set up a Just Giving page in March after her friend's 16-month-old daughter died. Ms Burke said Marli and her husband John could do with "one less thing to worry about," and should not have to think about rushing back to work. She added grieving families were in "no position, and no state of mind" to organise funerals and there should be someone in place to support and advocate for them. In 2017, the Welsh Government introduced Wales-wide guidance that burial and cremation fees be scrapped for children, although this does not affect funeral costs. Happy funerals: A celebration of life?